Owandy Radiology Inc, a global leader in the manufacture of dental radiology hardware and imaging software recently received FDA 510 (k) Clearance for its innovative 3-D wall-mounted panoramic digital radiography unit. The sleek and light-weight I-Max 3-D is only 145 lbs. and is shipped fully-assembled in one box. It can be easily wall-mounted by one technician. Comes equipped with a cone beam flat panel which delivers high-definition image quality. Multiple FOV’s (Fields of View): 4 volume sizes to choose from :12×10 cm ideal for implantology-full mouth and condyle, 9x9cm for a full mouth, 9×5 cm for a full arch. 24 Programs (including adult and child versions): Enable a full range of examinations required by today’s dental practice. Includes an intuitive, user-friendly Human Machine Interface (HMI) with automatically-integrated imaging tools and image-enhancing filters. CAD/CAM Ready: Equipped with QuickVision 3-D software for comprehensive case planning and can share .STL files from a dental lab or a digital scanner. 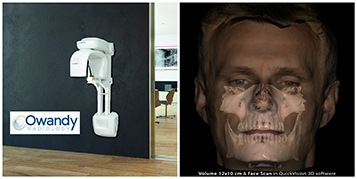 Face Features Scan: You can import .PLY or .OBJ files into your 3D software and associate the corresponding 3D volume.